There are perils involved in playing the piccolo, but there are also many rewards. Moreover, with the “population explosion” in the sheer number of flutists these days, you will find yourself more in demand than a correspondingly good flutist. The piccolo is a conspicuous voice that soars above the main body of the band or orchestra. You are a soloist whose sound, without forcing, is not lost or absorbed in the general anonymity of the ensemble. Because of the miniature finger work involved, the technique is easier and you will find the florid passages easier to play. The smaller opening in the embouchure requires less breath, so you will be able to play longer lines and compromise less with the breathing problem of the flute. When the woodwind section is charging in “tutta forza” in a technical “tutta” passage and, to an extent, is blanketed by the total sound, the singular piccolo is heard and is obliged to play all the notes. There is no place to hide, and that is precisely the occupational hazard-and-joy in trying to make a musical instrument out of the shrill and puckish piccolo. Ideally, the piccolo is a little flute and serves as an extension of the flute range – the low register of the piccolo should match the second octave of the flute and carry on up to its high C in a homogeneous scale without “shifting gears” as the octaves change. For me, and for most of the orchestral players, the wood piccolo, with its added resistance, more nearly matches this “flute” quality than the silver instrument, although the latter is perhaps more practical and convenient for the occasional player of the “doubler” because of its ease of playing. Some flutists resent playing piccolo. Because of the necessary additional pressure or speed of wind, it does tend to “muscle-bind” and tense the flute embouchure. However, for those flutists who have an overly spongy, “goldfish” embouchure, an interlude on piccolo can be a positive therapy and add a muscle tone they would not otherwise obtain. In general, I believe that players with thinner lips are the more likely candidates for the piccolo adventure simply because it is easier for them to adjust their lips to the smaller aperture. As to the playing, the basic approach is identical to that of the flute – except that the piccolo is a rather primitive instrument compared to the more domesticated and adjustable flute. In some respects it is a different instrument altogether – many have a different bore (conical, which produces a superior tone quality to the cylindrical bore of some piccolos), a different scale, different octave relationships and of course a different register. Because of its greatly reduced size, all of the adjustments you make are magnified and all of your movements are critical. There is much to be said about the psychological approach to the instrument. Due to the exposure many piccolo players try to play it “cool” and “pussyfoot” their way through the literature, but this invites trouble. The support and speed of wind will drop, and so will the pitch and the quality. Much like the trumpet, the piccolo should be heard and must be played with a kind of aggressive assurance. In some instances you must actually lead the woodwind section. By far, the greatest problem in playing the piccolo is in the tuning of the instrument in its delicate and sensitive upper registers. The player works with frequencies that accumulate in ratios so that, as he ascends, the “tonal-target” becomes narrower and narrower; i.e., the vibrations become so great (3,520 cycles per second for the top A) that the slightest alteration in pitch in a unison or octave will start the “beats” chattering in your ear. For this reason it is best not to double piccolos unless absolutely necessary. To complicate the situation further, most piano tuners “stretch” the upper octaves on that instrument; consequently, the ear comes to expect this sharpness, which makes pianissimo sustaining on the piccolo all the more difficult, for the tendency, of course, is for the pitch to drop. Similarly, the pitch tends to rise disproportionately in the fortissimos. To compensate for this, I pull out the head joint in extended forte passages and push in for the delicately sustained pianissimos together with changes in the direction of the air stream – down for the fortissimos and more across for the pianissimos. In tuning unisons or octaves with other instruments, make your adjustments slowly and do not “overcompensate”. Players frequently pass each other in the process; even a slight movement of the dead can alter the pitch. The “throat” tones (B, C, C#) tend to be sharp in the lower octave and flat in the middle. I sometimes use the harmonic fingerings for these notes in the middle octave, but the tuning of these varies from instrument to instrument, so you must find those which work for you. Always warm up the instrument before playing (I keep mine inside my jacket pocket) and never warm up a cold wood piccolo by blowing into it; the different rates of expansion between the interior bore and outside diameter can disastrously check or crack the body of the piccolo. 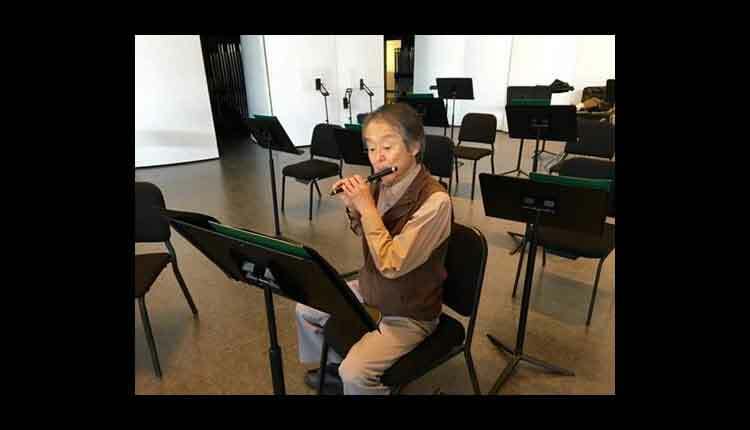 It is recommended to gently blow air into a metal piccolo with the finger holes closed to bring the instrument up to pitch. Again, this is not advised with a wood piccolo. You will find it very instructive and revealing to play scales and passages in unison with a sympathetic flute colleague – after first being reasonably sure that his tuning is reliable! And if there are precarious tunings with other winds or strings in a particular composition, do as other professional musicians do – test them in private before the concert so you will know where to “place” your pitch. For the sake of control, I put a very conspicuous alignment line on the head and body so that I have the same angle to work with every day, and also to make it easy to push, pull and align the tuning slide in a hurry. Again, because of the “miniaturization”, the placement of the instrument on the lower lip is very crucial for pitch and quality and should be done with great care and deliberation – the flute fits more easily and naturally into the indentation of the jaw. I perch the head joint a bit higher on the lip than the flute (to avoid smothering the embouchure hole) and generally direct the air more into the instrument and at the opposite wall than directly across (of course, this direction of air varies with the register and the interval) to obtain a so-called “darker” quality. This also avoids the chronically shrill, sharp and piercing tone so often painfully associated with the piccolo. There is a difference in response of some notes on the piccolo. The top G# requires extra pressure of the wind and will not speak easily without the clumsy addition of two fingers of the right hand, and the top (Bb), B and C all require that you raise the little finger of the right hand. All of this complicates the technique in rapid passages, and sometimes even the movement of the fingers will “jiggle” the embouchure out of adjustment. For reasons of smoothness, I sometimes swirl up on fast runs in the top register by overblowing the left hand (i.e., in A Major: A B C# D [A B C#] A). Every piccolo, by the way, must have a high B natural that speaks because there is just too much literature being written that involves it – occasionally pulling the head joint a bit will facilitate the response of this particular note. But what really strikes terror in the heart of a piccolo player are the high, sustained pianissimos he is obligated to play. Prokofiev and Shostakovich are particularly fond of them. Over the years I have learned that the secret (if there is one) is to relax the lips and let the air do the work. Keep the peripheral muscles of the embouchure firm but the cushion of the center soft, relaxed and slightly pursed forward, using a firm diaphragm in the meantime to support the flow of air. On the other hand, if you “bite” the air too hard, you will create a tension that is likely to set up self-defeating tremors in the embouchure muscles. The vibrato situation is essentially the same as that of the flute. I like to graduate the speed of the vibrato through the range of the instrument, i.e., slower in the low register and faster in the high register. Because of the higher range of the instrument, I use a faster vibrato in the top register than I ever would use on the flute. It is important to control the “width” or amplitude of the vibrato; a heavy, wide vibrato will sometimes upset the ensemble tuning, and some calm, quiet passages require just the merest hint of a vibrato. The articulation problems differ from the flute only in that the added pressure of the air striking the lips requires more resistance to keep them from buzzing. It does take a lot of strength in the lips just to hold them apart! I use little “kicks” of the diaphragm behind the tongue for dynamic attacks and “nudges” for the more gentle types. It is important to remember that the diaphragm and the abdominal muscles generate the sound and that the tongue is merely a valve to release this generated pressure. There are no piccolo methods as such and no one really gives piccolo lessons. For study materials it is best to borrow and adapt those of the flute literature that avoid the extreme ranges. The Berbiguier, Hugues and Andersen etudes are good, plus the indispensable calisthenics of the Taffanel-Gaubert “Daily Exercises”. Particularly valuable to me are the vocalizing-like patterns of the André Maquarre “Daily Exercises.”1 Memorize them, for the transpositions are a wonderful exercise for the ear. Because the piccolo requires less amount of breath than the flute, it is fun to play the long lines of the Baroque Sonatas without gasping. Get the convenient Lee Pocket Scores2 of the Handel and Bach Sonatas and make your own editions from the original. Many of us cut our teeth on the old-fashioned “Bird-Call” polkas popular in the early Band-In-The-Park days, but outside of these, there is practically no solo literature for the piccolo at all. There are three beautiful Vivaldi Concerti (two in C major and one in A minor), but all else must again be adapted from the appropriate flute literature. Finally, it is just good, clean exuberant fun to plunge into a good orchestral or band “tutti” and, to an extent, ride the sound like a surfer rides out the breakers. So have fun, and lots of luck. 1 G. Schirmer, Inc., N.Y.
2 L.P.S #70 and #10 respectively, P.O. Box 138 Audubon Station, N.Y. 32, N.Y.